Fiction based on alternative history might answer a lot of “what if” questions or simply tell a good story. But in either case alt. history is claiming the recognition that a historical event or figure can bring to the table and thus ground the reader. Jack the Ripper is of course a very well known historical figure: for both the horrifying crimes committed and the fact that they were never solved. In “The Silent Judge” David Landrum takes on the Ripper story from a unique perspective. The story’s narrator and ad hoc detective is a former client of Mary Jane Kelly, one of the Ripper’s victims. Although a supposedly good family man and a gentleman as well, he becomes driven by his love for the dead woman to find her killer. I appreciated the story for the amount of attention it paid to the lives of the Rippers victims and the people influenced by their deaths. A good read. “In Easter Parade, 1930” the historical character is the city of Glasgow. Rob McClure Smith immerses his readers into that period by way of the local dialect and the passions and prejudices of the city at that time. I must admit some bias here due to the fact that some of my ancestors came from Glasgow. On the other hand the story doesn’t contradict anything I’ve heard about the city from relatives. This one is definitely worth a read. Cheshire folklore provided the material for “Holy Water” by Andrew Knighton. This is a simple crime and punishment story made unique by the fact that the alleged offender is a statue of the Virgin Mary. Knighton gives us the predicament of the two men who are forced to carry out the sentence assigned to a precious relic. Anyone with a sense of irony would appreciate this story. In American history the civil war is an event that changed the country forever. However, throughout history, it’s not just about who wins at war, but how the peace is implemented. In “Lament for Lost Atlanta” the south still loses the conflict, but the reconstruction, after the war, takes a different turn. The story is told through the eyes of a boy, a descendent of the original southerners, who’s just barely entering his teen years. Although not initially keen on history, he learns by the end of the story how the past has shaped his life. Author Arlan Andrews gives new meaning to the phrase, ‘the south shall rise’ and gives the reader a realistic look at a society under siege. A good read. Adam and Eve, the apple and paradise lost are the traditional elements of an Eden story but in “The Bitterness of Apples” Priya Sharma gives us a story built more on the relationships between the characters than the events. Eden, for most of this story, is only a memory that may disappoint the reader. But, it’s a page-turner that has an ending with a twist. The nice thing about alternative history stories is that you usually end up with alternative scenarios. Ian Sales in “Traveling by Air” gives the reader three different ones concerning the development of travel by air. I appreciated the character development and the cause and effect of events, but I have to say that I have a problem with this story. Mr. 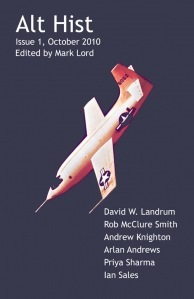 Sales assumes that air travel began with supersonic transportation and this is not the case. You can only go so far with alt. history.